It's been about 25 years since I had a meal at Kenney's, the late, great Roanoke-based regional fast food chain descended from Biff-Burger, but I still crave the taste from time to time. Long time steve's blog readers may remember my nostalgic ode to Kenney's in November 2004, and a mention of my friend Twig Gravely's great nostalgia site (which unfortunately has gone offline). 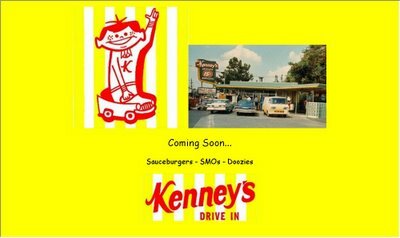 Twig wrote on June 23rd to happily inform me that a new, enhanced Kenney’s – Biff-Burger website will soon be online, so I'm passing along the good news. It's not ready yet, but you can see a preview here. It's not the same as some fresh, crispy Kenney's fried chicken, french fries, and fried biscuits hot from the kitchen, but it's definately a fun way to revisit the past.